i wish i can do my nails i only did it for one day and i took it off cuz it felt weird and stuff ' now i want one!!! errrghh is there one where u can buy it and stick 'em on? all you girls with long natural nails i am so jealous!!! my nails can't grow too long because they are weak. aw, i wish i can get my nails done. i never gotten them done before, not even for homecoming. but it's okay, my nails take forever to grow long and i end up chipping them or them being broken in the end since they are so weak. pretty nails. my hands look so stubby if i dont have longer nails, haha. I can't get my nails done anymore ever since I started wearing contacts. There's no way I'll be able to remove them. If I didn't play the violin and have to keep my nails short. I could do them. 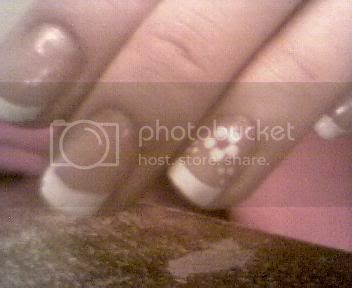 Although my mom owns a nail salon, so in the summer when my nails grow out, I have them done .